What do you call a thin band of color that you wear around your neck? What do you call a thin band of color that you wear around your wrist? What do you call a thin band of color that you wear around your finger? What do you call a thin band of color that you wear around your ankles? Many men are hesitant to wear jewelry because, well, whatever. No need to go there. In any case, colorful-but-classy socks can be a styley substitution for bracelets, necklaces, and rings. 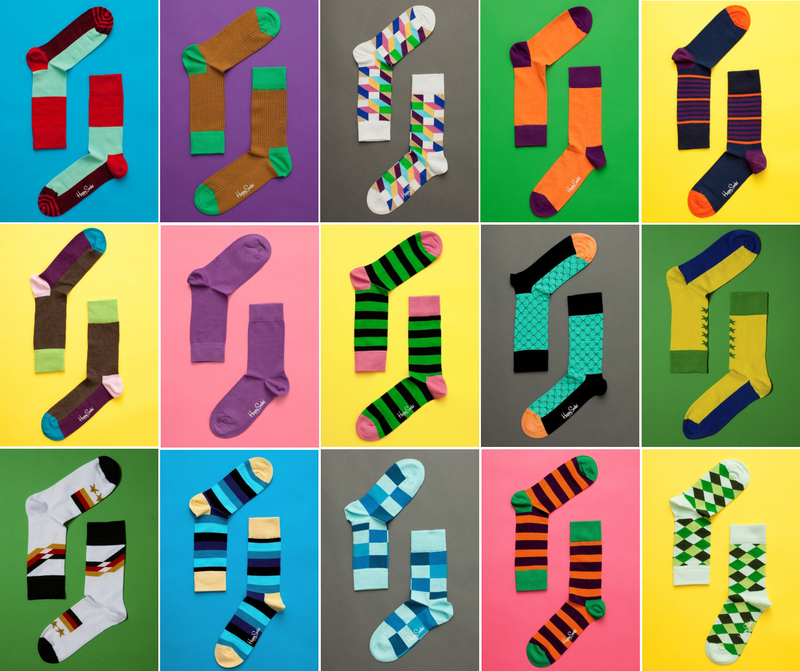 Here are some rules of “thumb-toe” for socks. Crank it up, but keep it under control. Yes, there is a bit of a “Happy Sock” thing going on out there, you don’t need goldfish, moons, or MC Escher on your socks. 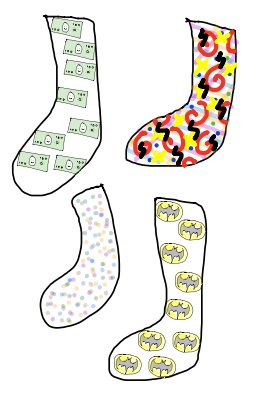 You do not want to be “the guy with the socks,” so avoid Bat-Man, the Benjamins, and over-the-top colors. Determine what color-palette you are wearing. It breathes and the colors pop. 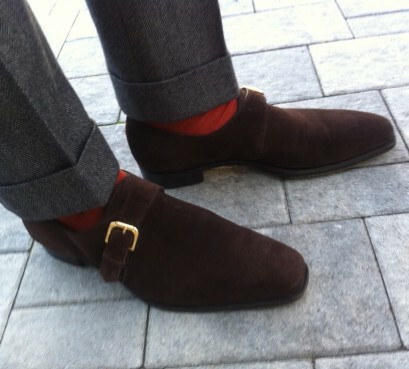 Avoid polyester-blend “dress socks” – the thin, wrinkly things sold at department stores and menswear stores. 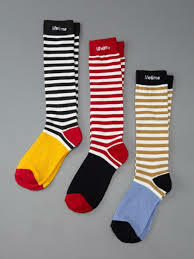 Stripes: go with one color, and wear with grey, blue, black, or red pants. Polka-dots: stick to one color. Only if they’re ONE color. 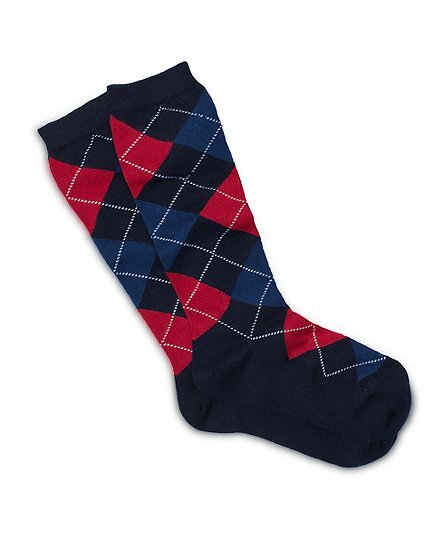 Argyle: Wear with wingtip shoes. Try purple and grey with a grey suit or red and blue for…anything. 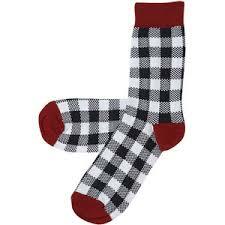 Gingham: Great with jeans, grey dress pants, or red/blue chinos (casual pants)! Will net you compliments. Stick to blue, red, brown and purple. Consider getting your pants tailored so there is no “break” – (“break” is the word for what normal people call the sag-fold that forms under your knee or near your cuff when your cuff hits your shoe). Have the tailor hem the pants so just a sliver of sock peeks out. Not only does this give you a streamlined, clean shape, but also, it shows your ankle-jewelry. I’ve learned from experience that socks are an amazing “just because” gift. They’re fun and don’t cost much. Next time you’re being dragged around a mall, try buying your girl-friend a pair of “just because” earrings; if you’re lucky, she may surprise you with a little “bling” of your own. Banana Republic: Get some nice stripeys. Richer / Poorer: Small company, great designs. Lifetime Collective: Never heard of them? Fix that. J.Crew: Yes, you’ve heard of them. But did you know they can be your sock purveyors? 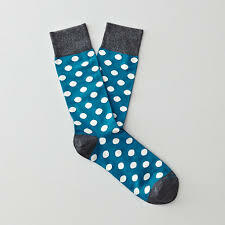 Happy Socks: Now that I’ve criticized them…if you keep the colors and patterns under control, they can be kind of amazing. 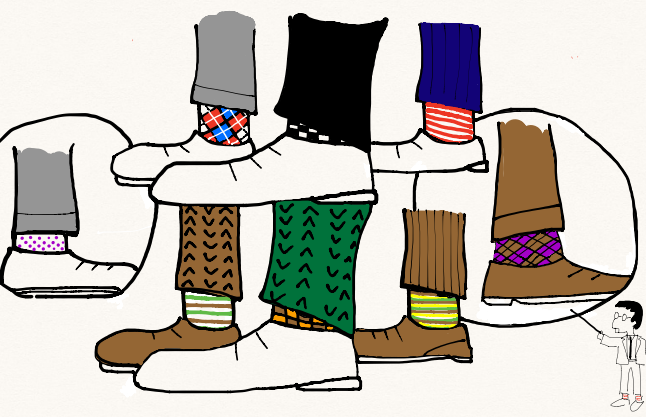 Quiz time: which of these Happy Socks are a little too much of a good thing?